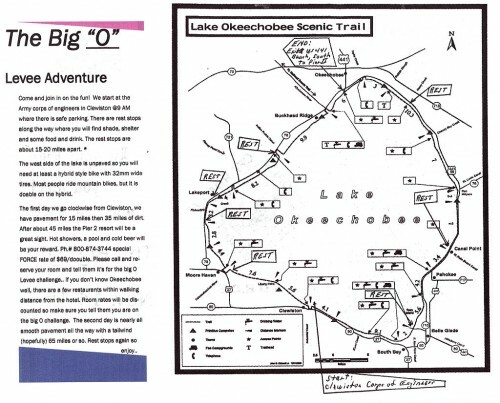 The Florida Off Road Cycling Enthusiasts – FORCE – are scheduling a Big “O” group ride around the Lake Okeechobee Scenic Trail (LOST) Saturday and Sunday, Nov. 14-15. The ride will leave at 9 A.M. from the Clewiston Army Corps of Engineers on the north side of U.S. 27 as you come into Clewiston. There is safe parking there. The whole ride is about 115 miles, done over two days. The first day, which is on the mostly unpaved west side of Lake Okeechobee, will cover 50 miles. Sunday’s ride will be paved, with a short stretch on a roadway that has adequate shoulders. Rest stops about every 15 to 20 miles. The group has made arrangements for a special FORCE rate with the Pier II Resort at the north end of the lake. Call 1-800-874-3744 to reserve your $69.99 double. Mention the Big O Levee Challenge to get the price break. The west side of the lake is unpaved, so you will need a bike with at least 32mm wide tires. If you plan to ride on a high-pressure, narrow-tired road bike, you may want to drop down off the dike onto Highway 78. It’s a low-traffic, wide-shouldered highway. You can see that route here. For more information, stop by the Bicyclery on Military Trail south of Okeechobee Road and ask for Tom Rassiga. OR, you can watch him on this video. That guy in the white shirt on the video won’t be there this weekend due to other plans, although he’d like to do a full moon ride now that it’s cooling off a bit. Bah! I’d love to do this but this weekend is already out for me. Maybe next year. It was a great weekend. The riders were super friendly; Tom, his wife and daughter were fun to be around; the weather was perfect. While we were riding clockwise around the lake, Dave and a bunch from Broward County started near where we did in Clewiston and rode counterclockwise. They met up with us briefly at the end and promised a ride report. It’ll take me a couple of days to get the photos and video edited, so be patient. I was wondering why they call Lake Okeechobee the LOST. I live in Clewiston, perhaps that’s why I don’t know. I do however feel very blessed to have such a great place to ride. I can go any time and as far as I want. It’s actually L.O.S.T., which stands for Lake Okeechobee Scenic Trail. That’s quite a mouthful, so most of us just say we’re going to ride the LOST this weekend. 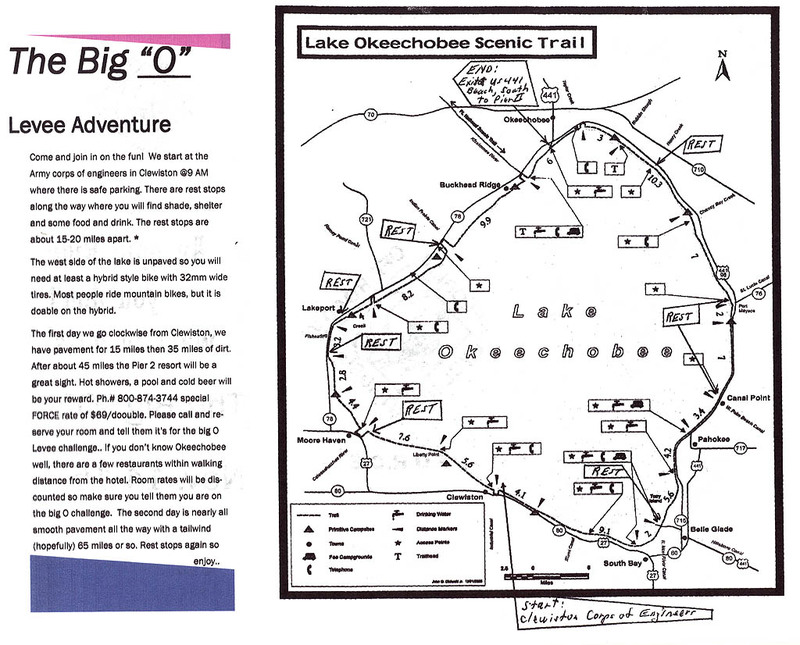 LOST is an acronym for Lake Okeechobee Scenic Trail. There are links on that page to other good sites with info on the trail. If you want a real treat, cycle on it at sunset during a full moon. You watch the sun set and the moon rise over the lake. VERY nice ride.